A Gent in Training: Why Work Out? 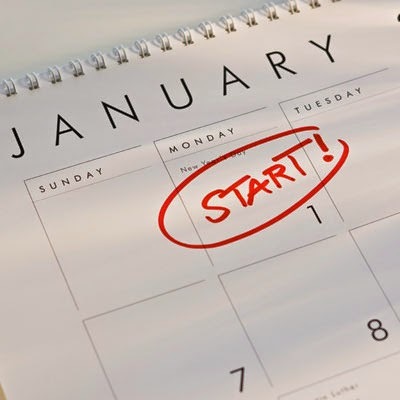 It's January, the time of year when many people start working out as part of their New Year's resolutions. But how often do they stop to think about why they want to work out in the first place? Quite a few people would probably be taken aback by that question, perhaps responding with a vague answer such as "to get in shape." What does that mean, though? A powerlifter and a gymnast, for example, are both "in shape" in very different ways. Knowing the why you workout is important, because it will determine the how you workout. Individuals need to really think about what they specifically want to accomplish, do their research, and figure out the best way to proceed. For years, I floundered at fitness, mostly because all I knew is I wanted to "get in shape." I didn't really know what I meant by that, so I just ran around, went to the gym, goofed around with weights and machines, and didn't get anywhere. 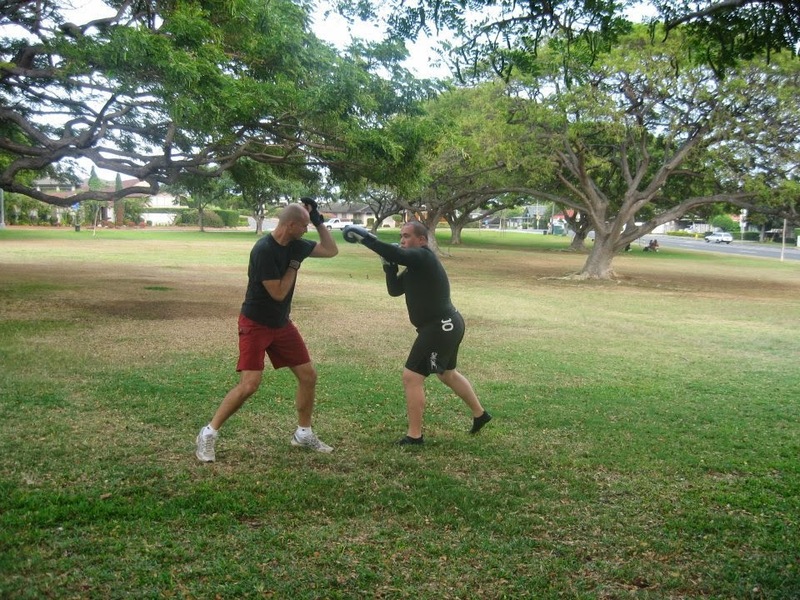 What helped me focus was getting serious about my martial arts training. I decided I didn't care about having a six-pack, being able to run a marathon, or benching 300 pounds. I just wanted to be a better fighter. And I don't mean I wanted to get fit like a professional, UFC-level fighter. I simply want to be fit enough to do well when I train or spar with friends and be reasonably prepared in the event of some sort of actual altercation. To accomplish this, I needed to concentrate on endurance, explosiveness, functional strength, and flexibility. This realization made a world of difference. I ditched the gym and started concentrating on bodyweight exercises and conditioning. I added kettlebells to the mix, and got more consistent in my yoga practice. 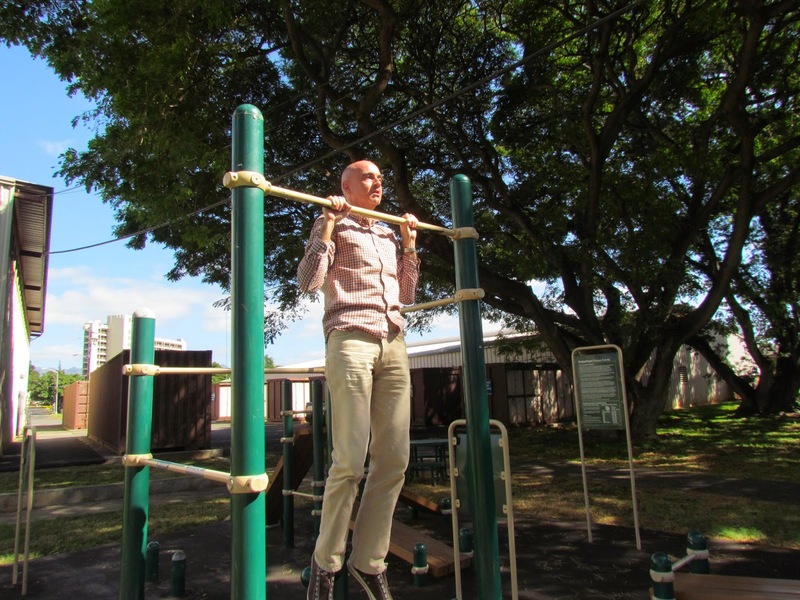 Doing a Pull-Up during my coffee break at work. Nowadays, my workouts are quite simple. I mostly stick to a few basic exercises: Kettlebell Turkish Get-Ups and Swings, Push-Ups, Chin-Ups, some core work, occasional sprints, and yoga. I find these to be the most effective exercises in helping me meet my goal of being a better martial artist. The Get-Ups build shoulder stability and core strength while helping me do a better job of actually getting up when groundfighting. Swings are excellent for explosiveness. As many an old-school boxer knew, Push-Ups and Chin-Ups are perfect for functional strength. Yoga keeps me flexible and helps prevent injuries. While just doing a few exercises day in, day out might strike some as boring, I find a certain Zen-like calm in the repetitiveness. Besides, if I want excitement and variety, I can always call up a friend and we can go box or hit each other with sticks in the park. (Trust me, every punch in the face is a unique experience.) More importantly, the point of my workouts isn't just to workout. It's to be improve in my martial endeavors, and that isn't boring to me at all.